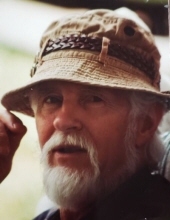 Everett C. Sparks, 83, of Bradshaw, WV finished his earthly journey at 10 p.m. Tuesday, January 8, 2019 at his residence, his beloved and loving family beside him. A celebration of life service will be held for Everett at 6 p.m. Saturday, April 13, 2019 at the Three Forks Church of God with Pastor Larry Allen officiating. All are welcome to visit as Everett's loved ones celebrate his life. Military rites will be conducted following these services. Everett, E.C. as he was known by his family and friends, was born at Lex, WV on November 5, 1935, the first born of the four sons of the late James Everett and Oma Bell Addair Sparks, lifelong residents of the Bradshaw Coal Camp where E.C. was raised. Other than his parents, E.C. was preceded in death by his youngest brother Darrell Sparks, an infant sister Marlene Sparks, and a sister-in-law Debbie Sparks. Also preceding him in death were his best friends Hubert Fain and Rufus Hagerman, both of Jolo; his beloved mother and father-in-law James H. and Patsy Hagerman Riffe; two sisters-in-law Theodora Riffe Rife of Jolo and Sarah C. Riffe of Kentucky; two brothers-in-law Jim Riffe of Ohio, Ernest Rife of Virginia, and Teddy Proffit of Ohio; and a special nephew Ricky Shane Proffit in 1961. Surviving E.C, to remember him with joy and to mourn his passing, are his wife of 59 years Bonnie Riffe Sparks of the home; his pride and comfort Jamie Sparks of Jolo and companion Melissa Anne Hagerman, who he loved as a daughter; his adored and adoring daughter Tiffany Sparks Hanna of Sissonville and husband Tony Hanna; two brothers, Ernest Sparks of Princeton and Swanson Sparks of Jolo; four grandchildren, Ryan Sparks of Galax, VA, Kristin Brown of Princeton, Victoria Meadows of Mountain City, TN, and Brian Walker of Jolo; and four great-grandchildren, Abigail, Bently, and Chloe Pruitt, and Cheyenne Sparks; and several nieces and nephews. E.C.’s wife’s family became his family, sharing his joys and sorrows and he loved and was loved by each of them; Elizabeth Riffe, Brandon Riffe, Phyllis Proffit, Kathy Riffe, Dot and Jarrell Hoskins, Kay and John Tholander, Kathy and Larry Allen, Donna Rife, Everett Rife, and Kim Riffe, along with numerous in-law nieces and nephews. he is also survived by his friends Connie Jewell, Randall Arrington, and Merle Puckett. E.C. served in the Army and was active duty from 1961 to 1963 and remained in the Army Reserves until 1967. He retired from his job as a preparation plant mechanic for MAPCO Coal Company in 1994. E.C. loved the world God made. He loved walking along the riverbanks and the small creeks and roaming the mountains. He enjoyed riding the ridges, trading guns and knives, target shooting, feeding the birds, and watching the moon rise and sun set. Honoring his wishes, E.C. was cremated and an inurnment will be held later this year. To send flowers or a remembrance gift to the family of Everett C. Sparks, please visit our Tribute Store. "Email Address" would like to share the life celebration of Everett C. Sparks. Click on the "link" to go to share a favorite memory or leave a condolence message for the family.